Let's be honest. 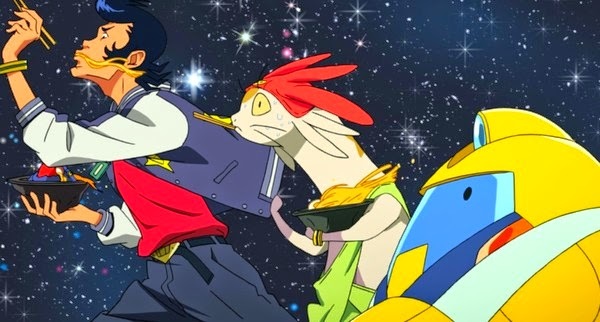 There was no way I wasn't going to love Space Dandy after those opening credits. 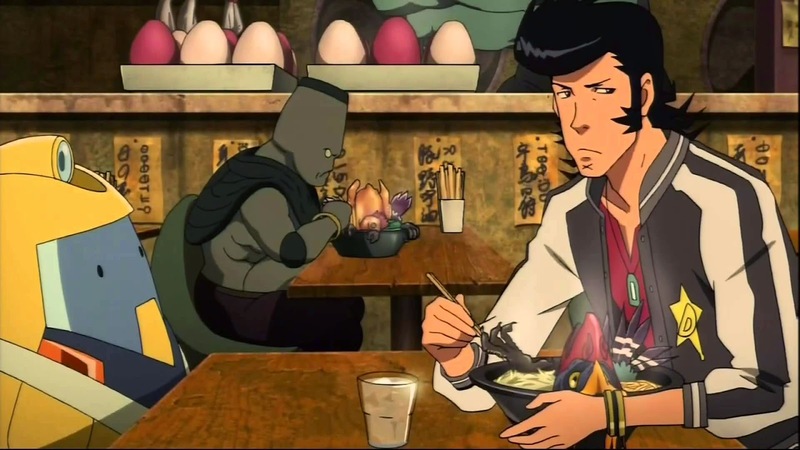 Longtime fans of Shinichiro Watanabe's magnum opus Cowboy Bebop will find a lot of familiarity from the get-go with Space Dandy. That's not necessarily a bad thing, given how amazingly super-fantastico Bebop was back in the day, and its balanced by Dandy being as to Bebop what a mango is to a dragonfruit. 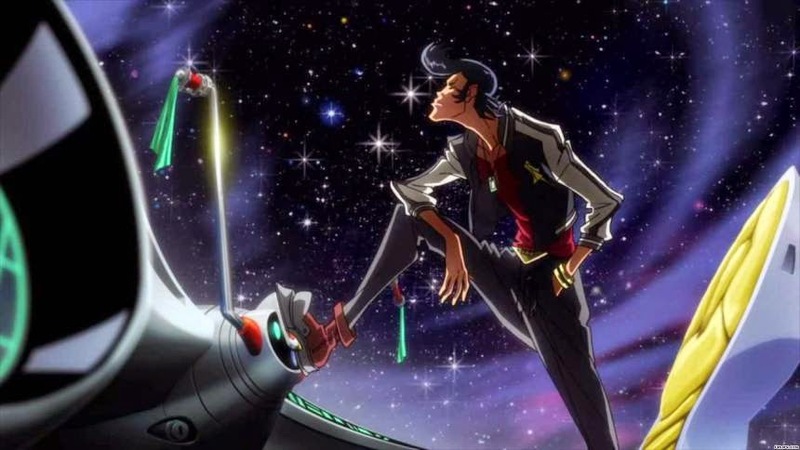 Set in a future strongly evoking Firefly by way of Futurama with a dash of Evangelion's more-than-meets-the-eye plot, Space Dandy follows the titular space-faring main character on his spaceship along with his space-crew as they complete missions...in space. Dandy is accompanied by QT, the kind of robot I imagine Portal's GLaDOS might be if she stopped taking crazy pills, and Meow, a catlike Betelgeusian almost as lazy and lady-obsessed as Dandy. Together the three search for new alien life across a galaxy rife with possibility, all the while unknowingly evading the clutches of the heinously evil Gogol Empire and their Ghost Rider-wannabe leader, Admiral Perry. This is also in addition to the quest Dandy has of visiting every "BOOBIES" in the galaxy, a "breastaurant" chain that's like Hooters turned up to 11 charged by a blurred distinction between irony, parody and fanservice. Now, let me make it clear that if you think the above description makes Space Dandy sound like a goofy, colourful, hilarious and occasionally serious romp with as much substance as a broken thermometer, you'd be on the right track. It's a highly accessible and engaging series that really plays up its retro roots; the opening credits have a distinct 80s VHS feel to both the visuals and the narration, while the episode's plots seem mostly standalone and usually involve some kind of variant on the standard 'crew search for an alien/MacGuffin that is more complex or difficult to obtain than it seems' narrative. But, as with Evangelion, there is more beneath the surface of this gaudy, technicolour escapade. From the first episode it seems something's up, since (SPOILERS for those who'd rather remain vestal) all of the main characters die at the end. They then appear seemingly fine in the next episode, none the worse for wear and with no knowledge or mention of the lethal adventure that ended their lives. So, yeah. We're playing with a multiverse, here. That's what I gather, at any rate. Any mentions of continuity errors, instant next-episode recoveries or blatant ignorance of standalone plots (including a spin on zombies during Episode 4) are fleeting and barely dwelt upon, if they are to begin with. At times Space Dandy almost feels like an anthology series, with several main big plots interspersed with standalone stories focusing on different characters or settings within the universe. It can make the flow of the narrative hard to follow at times, but if you approach things with the same laissez-faire attitude the series takes then it starts to become easier to swallow. The show's approachability is also helped by some great voice acting on the English dub. Ian Sinclair does an excellent job as Dandy, thankfully eschewing the gravelly qualities of Steve Blum and avoiding becoming a funnier Spike Spiegel ersatz, while the wide variety of guest and recurring voice actors on display are all well acquitted and awesome. As with Bebop, the show also does excellently with music choices and a killer score handled by the Space Dandy Band (no, seriously, that's what they're credited as). 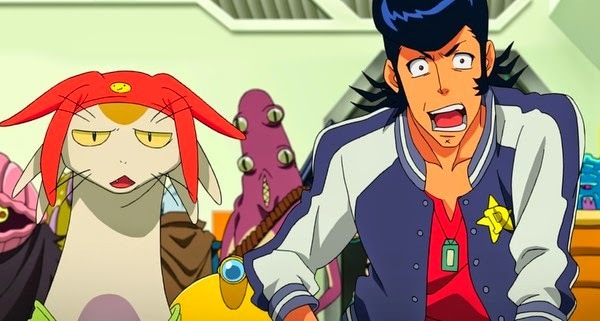 I'm probably being a bit too complimentary here, but the fact is I was biased to love Space Dandy from the get-go. There's not much more I could say about it that wouldn't be repeating the same praise as above. It's a frenetic, hilarious and exceptionally colourful display - seriously, the art schemes, hues and pallets used are gorgeous - that hits all my right buttons. If you're looking for the old Bebop kind of feel, you can't do much better, baby. 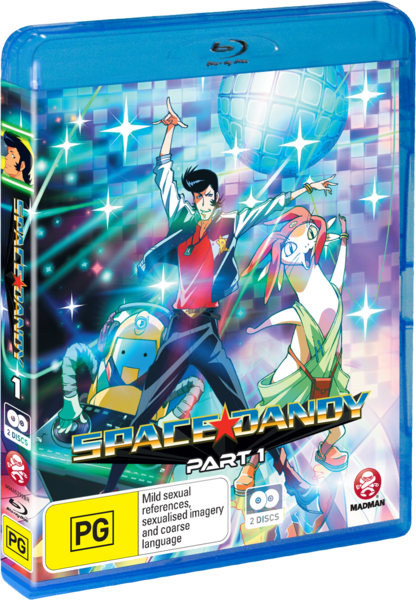 Space Dandy: Part 1 is available on DVD and Blu-Ray from Madman now!